• Continued CO2 (and other greenhouse gas) emissions are very likely to affect the outcomes of regional and national plans to maintain or improve socio-economic benefits derived from industrial tuna fisheries and small-scale, coastal fisheries. • Global warming is likely to affect food webs supporting tropical tuna species, and very likely to cause changes in distribution and abundance of tuna by 2050 under the RCP8.5 emissions scenario. • Redistribution of tropical tuna is very likely to affect licence revenues from purseseine fishing, and shift more fishing into high seas areas. • Harvest strategies for tropical tuna will very likely need to account for changes in distribution and abundance resulting from climate change. • Priority adaptations to maintain the economic benefits of industrial tuna fisheries will need to focus on interventions to maintain licence revenues, and ensure delivery of fish to local canneries. • Global warming, extreme events, and ocean acidification are very likely to damage coral reefs and other habitats underpinning small-scale, coastal fisheries for demersal fish and invertebrates. • Changes to coral reefs and other fish habitats, and the direct effects of CO2 emissions on fish and invertebrates, are likely to reduce harvests from small-scale, coastal fisheries by up to 20 percent by 2050, and by up to 50 percent by 2100, under the RCP8.5 emissions scenario. 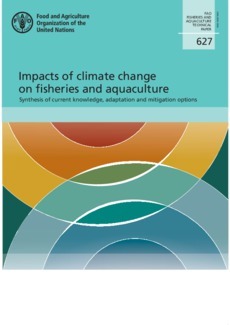 • Climate change is very likely to increase uncertainty in replenishment of coastal fish stocks, requiring a more conservative community-based ecosystem approach to fisheries management.